The War on Animals is a truly a world war, as China is quickly finding out. More bad news: Apparently birds can speak Chinese, which has to be way harder than English. But, those halcyon days of gloating from your Pontiac Aztec or PT Cruiser at stupider spending choices may be numbered. The Chinese have backed out of purchase negotiations of the line from General Motors. With no buyers, GM may be forced to shut down the brand, ending all production. This may be the worst news for douchebags since cone snails, which are where puka shells come from, were added to the endangered species list. GM will continue to look for offers for Hummer, but it’s not looking good to spokesman Nick Richards. 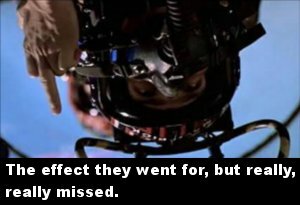 If Top Gun taught us anything, it’s that communism is best faced over international waters as wet and nakedly as possible. That was 1986. Since then, the military has faced numerous anti-Top Gun obstacles, including the collapse of communism in the Soviet Union and the “Don’t Ask, Don’t Tell” policy. However, in 2009, the Navy truly loves the ’80s, thanks in part to the Chinese. During a surveillance mission over 100 miles off the coast of China, the USNS Impeccable found a collection Chinese naval, state and civilian vessels shadowing it. Two of the ships approached, their crews waving Chinese flags and telling the Impeccable to go home. The Impeccable, knowing this was the Top Gun moment they had waited their entire careers for, opened up on them with their fire hoses. Creeped out but not wanting to seem homophobic, the Impeccable informed the ships “in a friendly manner” that they were leaving the area. One of the Chinese vessels maneuvered directly in front of the Impeccable, forcing her to an all-stop. They then dropped their large wooden plank right in front of the American’s nose. Still, the Impeccable escaped. U.S. and Chinese officials have each lodged complaints against the other’s actions in what may be the world’s first maritime legal “You know how I know you’re gay?” arguments.